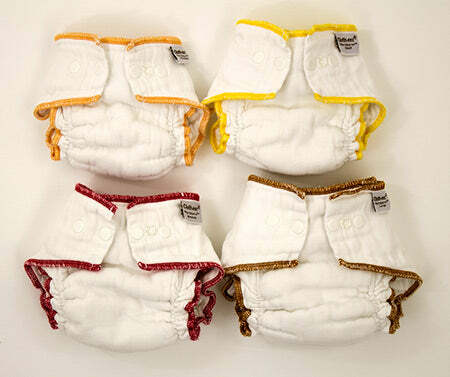 Workhorse cloth diapers are made in 4 versions. 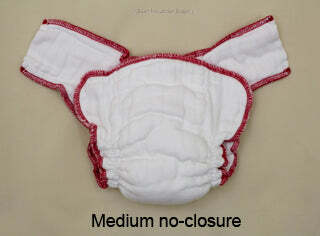 White cotton with snaps or no-closure and in made of certified organic cotton in snaps or no-closure. 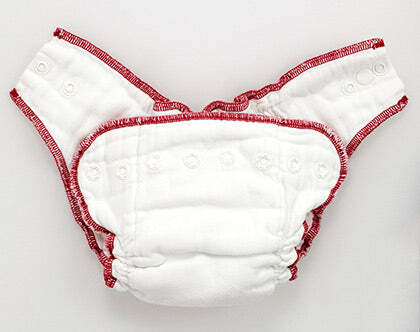 Note: This is a diaper (the absorbent part). A diaper cover is needed over it, sold separately. Our white cotton is chlorine-free and optical brightener-free. The organic version is unbleached and needs several wash cycles before first use since it is unbleached. All versions are OEKO TEX certified to standard 100. 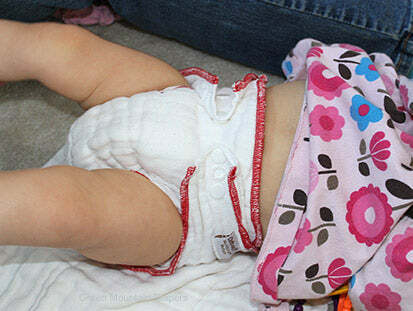 Why choose a fitted diaper instead of an all-in-one with the cover built in? 1. Washability. 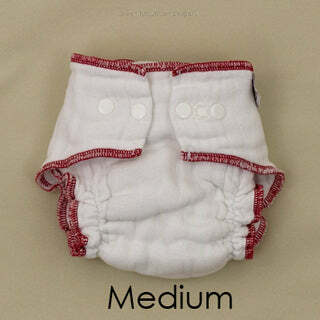 Water washes all the way through the fabric so the diapers clean more easily and dry well. 2. Cost. 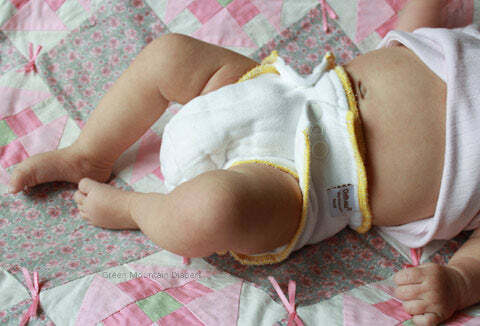 You can re-use the same diaper cover through several changes. 3. Fewer leaks. 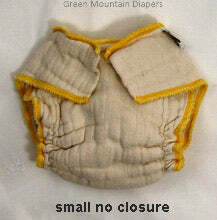 When the the diaper and cover are actually two separate pieces there is less chance of wicking. Also the cover provides a second layer of defense. 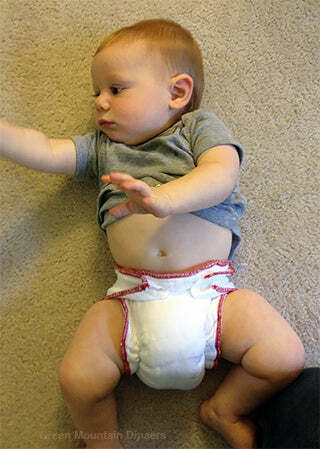 Should anything happen to escape past the diaper, the cover will catch it. Wonderful! It's the same 100% cotton fabric as our beloved prefolds. 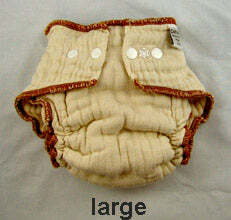 Because of the nature of the prefold fabric, these will also vary in shrinkage somewhat, just like prefolds do. 8 layers of cotton in the body and 8 layers in the flap for sizes medium, large and XL for a total of 16 layers! 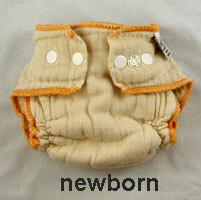 Size newborn and small have a 6 layer flap which is a more appropriate thickness for a younger baby. 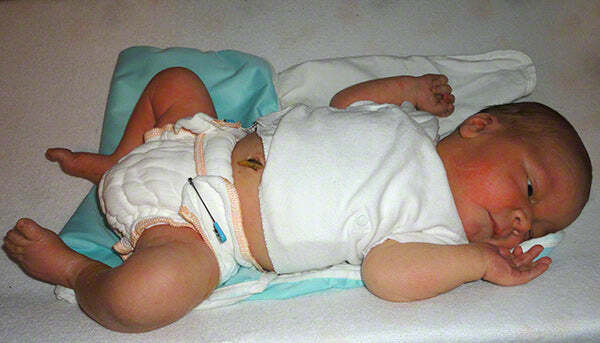 As with any diaper, you can add a doubler or a preemie diaper for additional absorbency for long outings, naps or nighttime as needed. 8 pounds 10 ounces, 7 days old in size newborn no closure. The front is folded down. There is plenty of growing room. 1 day old, 8 pounds, 5 ounces. The front is folded down. 1 week old, 6 pounds, 15 ounces. Front folded down. Snap or No-Closure? 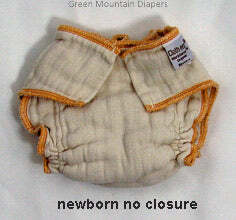 New babies come in many sizes and the newborn size Workhorse no-closure is a very flexible fit. 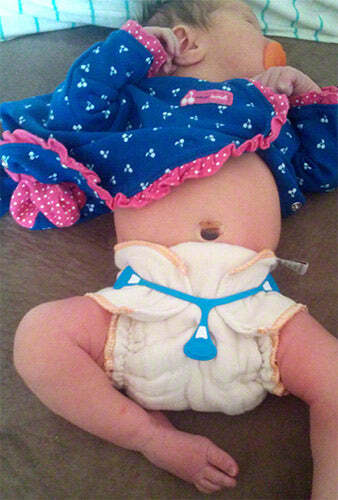 If you get the snap version and baby is under 7 pounds, then you can still fold down the front to get this nice fit. Just pretend the snaps are not there and use a Snappi or pin it, ignoring the snaps, until it fits in the regular snapped position, which doesn't take long. Babies grow very quickly! Just because the snap version has snaps does not mean you have to use the snaps right away. Five pound little baby in size newborn. It is big, but it works. Do you prefer stay-dry? 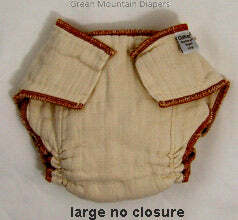 Turn it into a stay-dry diaper by adding a Stay-Dry Liner or small Stay-Dry Doubler. For those who use synthetics and prefer a stay-dry fabric, having the fleece liner as a separate piece is best because it works as an easy liner to get poop off, and since the fleece is one layer and separate, it washes easily and doesn't get stinky like the pocket kind or kind with sewn-on synthetics often do. 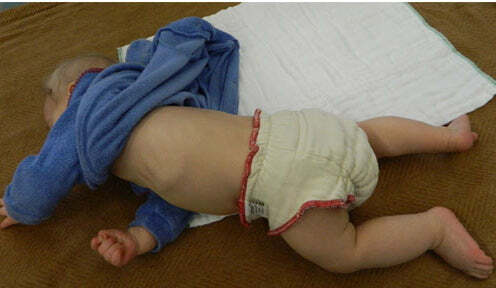 Separates are much less likely to get bacteria problems (stink and rash issues) than sewn-on synthetics. However, you quite possibly you may start to not bother to putting the stay dry liner in and thus discover that baby is completely fine with cotton next to skin and end up preferring the cotton. Either way is fine. Do what works for you. 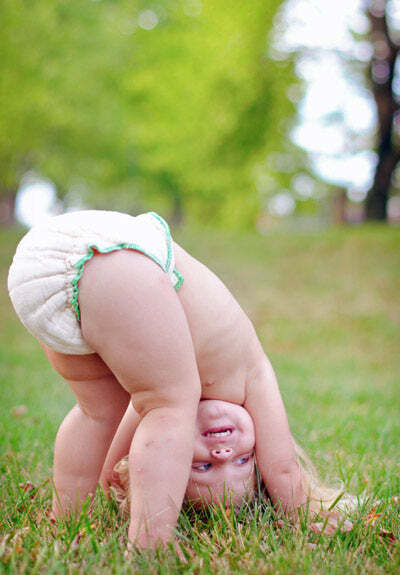 Sometimes when you need extra time in the same diaper, such as at night, adding a stay-dry doubler can really help. 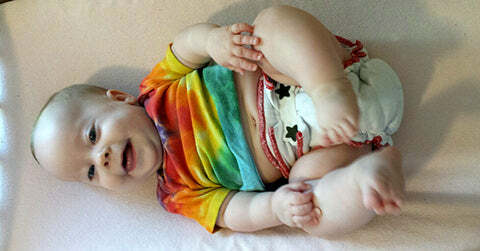 Pure 100% cotton next to baby's skin does not cause rashes and has been proven safe and effective over many generations. 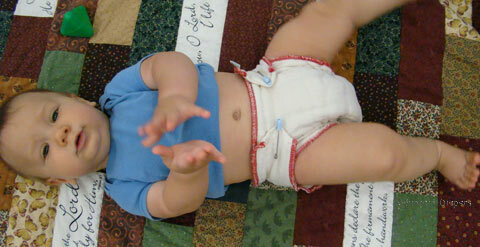 Cotton also absorbs faster than other diapering fabrics so it is very unlikely to leak and does not repel. 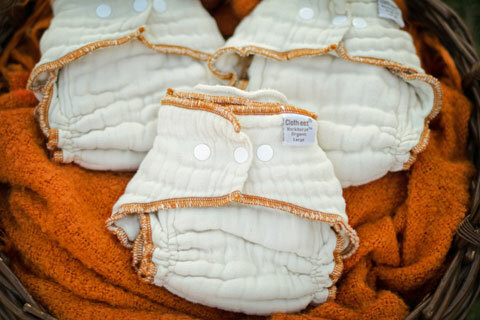 Cotton is king of cloth diapering, and organically grown is even more wonderful! I know that big companies have convinced people that wetness causes rashes, but in reality that is not true. 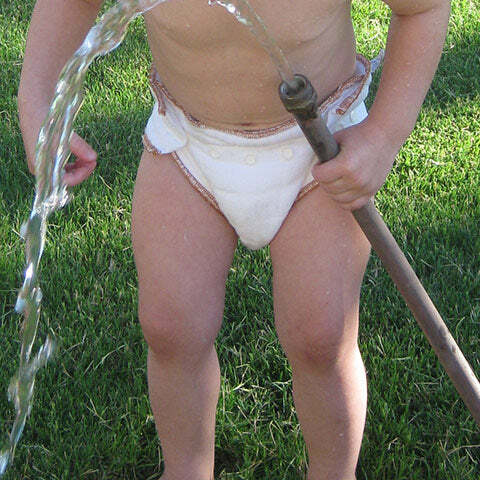 Urine is sterile when it leaves the body and it does not cause rashes. Moisture next to skin for a little while is not a problem. 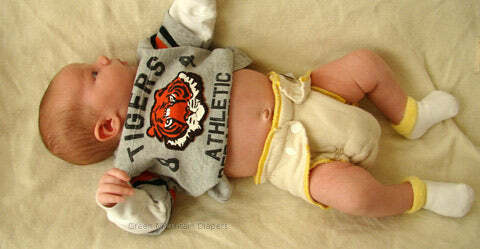 Going much too long between changes or having diapers not clean enough after washing (bacteria) causes rashes. Thus, it's important to choose fabrics that wash up cleanly. Clean-washing 100% cotton is best. Plus, with 100% cotton you do not need any special detergents. 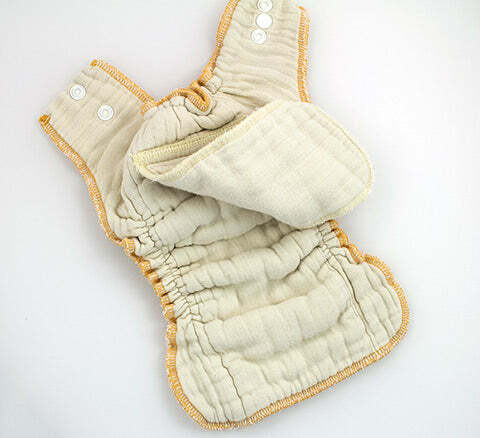 You can use anything you like when you use cotton (but please no fabric softener or dryer sheets). 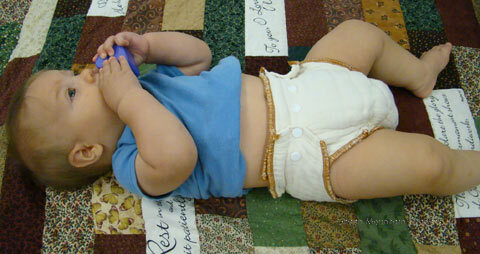 100% cotton diapers keep cloth diapering, and washing the diapers, simple. 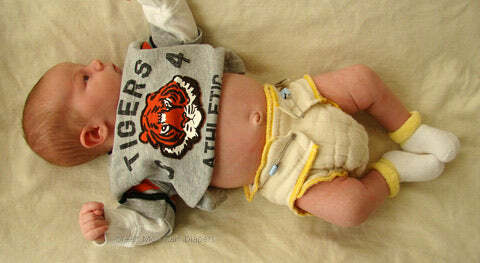 Baby in Tigers shirt in size small no closure and snap closure for comparison of closure styles. 3 months, 12 pounds in white size small. The first one is snap closure and the second one is pinned with just 1 pin. She has a small, petite bottom. 6 weeks old and a big 11 pounds in Workhorse size small no-closure with a Thirsties Duo Snap size 1 over it at the medium rise snap setting. 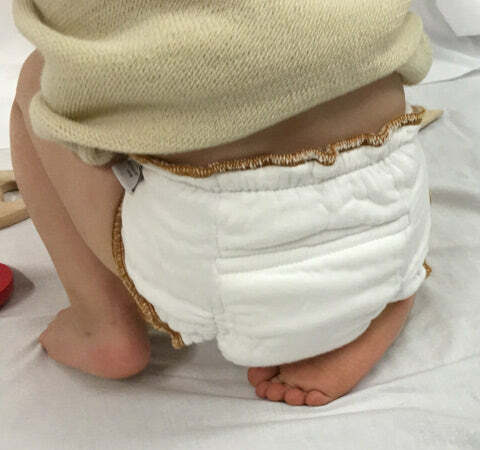 The Workhorse extra rise (length of the front of the diaper) could have been (and perhaps should have been) folded down before fastening it with the Snappi if a shorter rise is preferred but not folding it down works just fine already. There are no rules about how to do this. 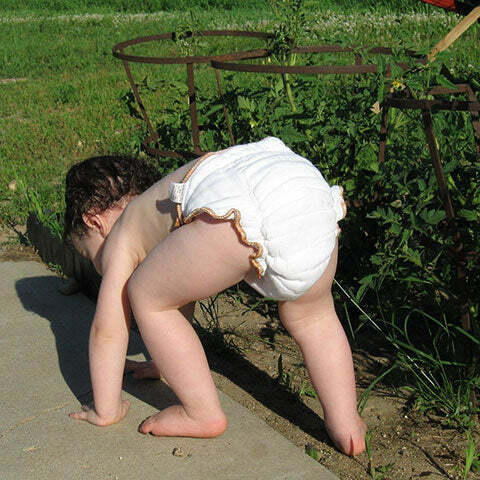 It just needs to do what a diaper needs to do, and that's all. Babies grow so quickly. By making sure the rise pulled is up enough like it is in this picture, then that makes the leg elastics snug up to just right so it contains things very nicely. This ability to adjust the rise of the Workhorse No-Closure is what makes it so adjustable and what makes it possible to skip a size for some babies. 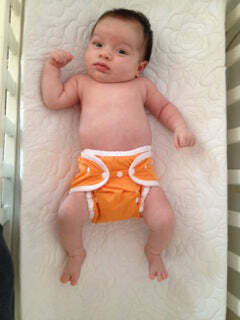 2 months old, 13 pounds 10 ounces (Big boy! Nearly 14 pounds at just 2 months old) in size small. 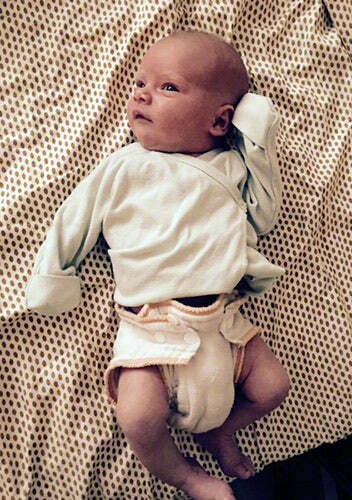 If your baby is this size, then start in newborn, skip small and go right to medium Workhorse. There is a size difference between small and medium but it is not a huge jump up. Medium has 2 more layers of absorbency in the flap (8 layers) whereas small has 6 layers. Fast growing babies may want to skip a size. Same baby as above, 13 pounds 10 ounces also is starting to fit size medium already. At 2 months old, he is growing quickly. 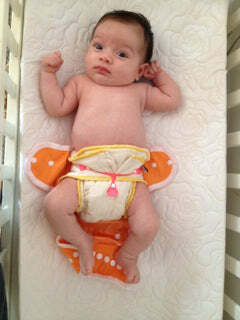 A fast grower like this baby can skip size small and go newborn to medium then large. Get a custom fit with the no closure versions. Medium fastened with a Snappi Fastener shown. 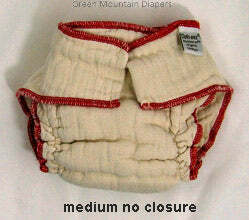 No closure medium on a baby with a small bottom. Customize the fit to your baby's shape. 5 months old in medium no-closure. A Boingo is used to fasten it. A different baby, 7 months 20 pounds, size medium. 5 pounds heavier and broader hips than the baby above. Medium still fits and is trim but I'd purchase large at this point for this baby to get more coverage in the back. Compare to large on this baby below. The wings are longer on the no closure version so this baby is wider than the fastening position makes it seem. I wish I had taken a picture of this baby in a Medium snap version for a better comparison. Same baby as above, 7 months 20 pounds, There is a noticeable size jump between medium and large. 7 months 20 pounds, size large. It's a little big but works fine with plenty of growing room. On a narrower or trimmer baby with a flatter backside this large would really be too big, but this baby has broad hips and a high rise so large works already. Medium on a petite 9 month old 15 pound baby. 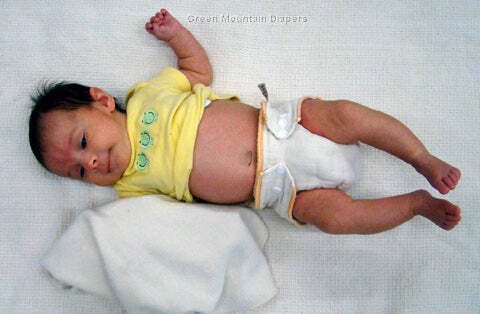 Broader, fuller-shaped babies will size up to size large brown edge to get more rise sooner. Read more below to choose your best size. 16 months old, 20 pounds, trim baby in size medium snap. This is a "small bottom" baby shape. 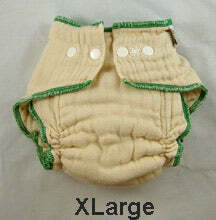 Fuller, rounder shaped bottoms will need size large at this age. 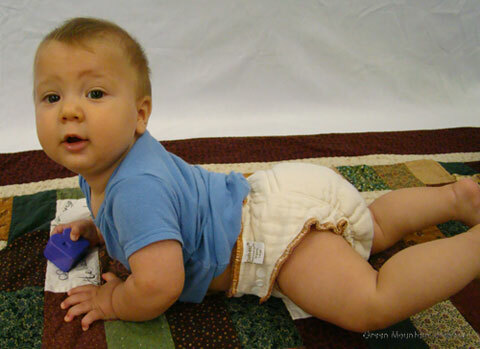 The shape of baby matters a lot when picking the right size size for older babies. 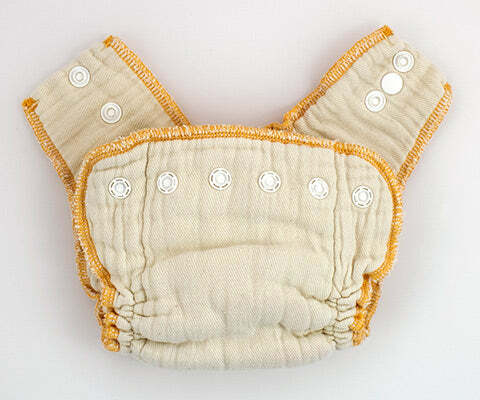 A size large sags off this baby but medium is a wonderful fit. See the rise is much higher on him in the large brown edge (look closely at where his belly button is) so you will need to use a cover big enough to cover it (Thirsties Cover size Medium or other medium cover would work on him). Mom could have folded down the rise on the large brown edge before pinning it for a snugger fit in the legs. It can be ok to skip a size in Workhorse. You can go newborn to medium. 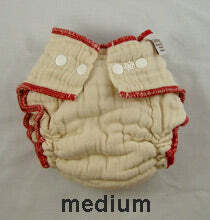 Or if you have a big newborn, you can go small to large and skip newborn and medium. Skipping a size is a choice but it can work. It is easier to skip a size with the no-closure version because it is more adjustable but it can work with the snap version too. 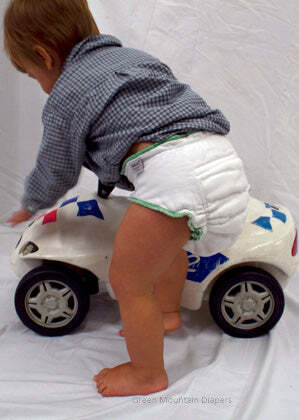 If the diaper is too big and the rise is too high, the legs will gap. 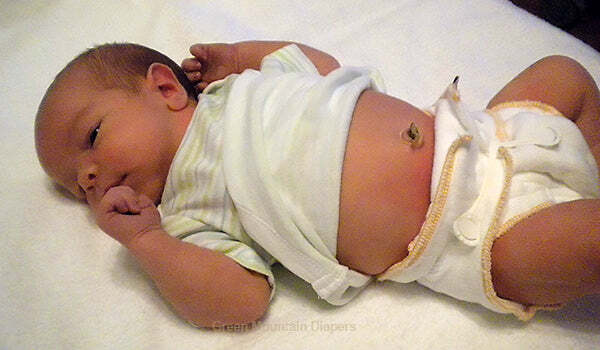 So if you choose the snap version and the diaper is too big on baby, then you can pin (or Snappi fasten) the snap version so that the rise fits and ignore the snaps until they fit snapped. The snaps are in the way somewhat but it could still be done if needed. Pinning will always give you the best custom fit. Of course, getting the size that fits now is best, but I just point out these things along the way in case it is helpful to someone. A young chubby baby almost one year old might need size large. A medium would not have enough rise to cover all the roundness of this full shape, so large is needed on her. 2 years old in XL, 30 pounds. Plenty of rise in the back and growing room. This toddler is big and broad. Notice the body shape difference between this child and the 25 pound 2 year old above in the size large. 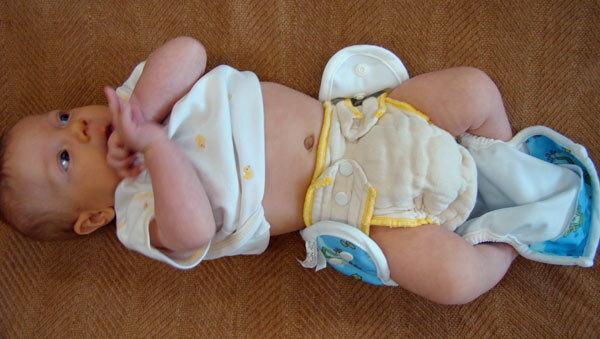 Snaps across the front are hidden underneath the cotton so the back of the snaps do not touch the baby. All sizes come with a built in flap. Newborn and small have a 6 layer flap. Medium, Large and XL have an 8 layer flap. The flap is attached at one end to help speed drying time and make washing easier. It also can help make cleanup easier, too. There is no cover shown in the picture. The picture is beautiful and shows the diaper, but if Mom holds baby like this for too long without a diaper cover, Mom's shirt would get damp soon enough after baby wets so please use a diaper cover. 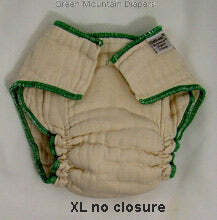 Workhorse diapers work with many brands of diaper covers. 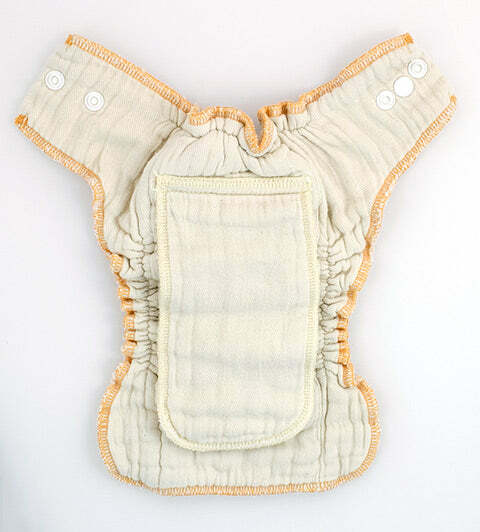 Note: This is a diaper. It requires a cover. Don't forget to add your 16 page GMD How-To Booklet to you cart or click the box in the checkout to get it. It's a treasure-trove of information and it's free with your order.